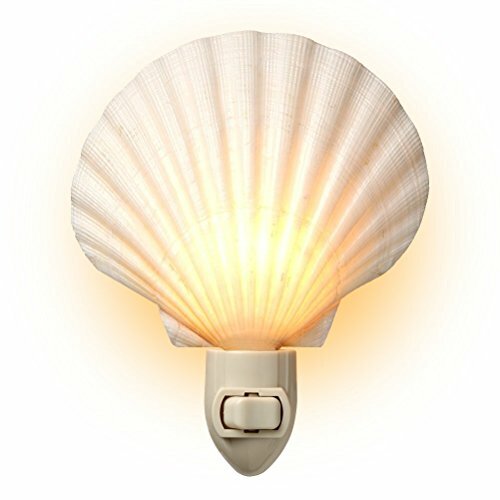 Natural Handmade Night Light - featuring a gorgeous white clam shell straight from the beach. A fabulous way to illuminate any room with cozy beach style. Place throughout the home to provide gentle light to guide you and your loved ones safely in the night. Excellent for use as mood lighting! Try various colors of light bulbs to change the ambiance. Provides subtle lighting for halls, bath, kitchen and bedroom. No glare - just a warm glowing effect. UL rated, listed for safety. Easy to use on/off switch. Easy to change bulb. Natural Handmade Night Light - featuring a gorgeous white clam shell straight from the beach. Provides subtle lighting for halls, bath, kitchen and bedroom. No glare - just a warm glowing effect.